Verselandia! went big for its second year, with the Wonder Ballroom hosting the all-PPS high school poetry slam on April 30. The thirty finalists from Benson, Cleveland, Franklin, Grant, Jefferson, Lincoln, Madison, Metropolitan Learning Center, Roosevelt, and Wilson high schools had a full year to prepare for this year’s event, and the preparation definitely shone through in the performances. 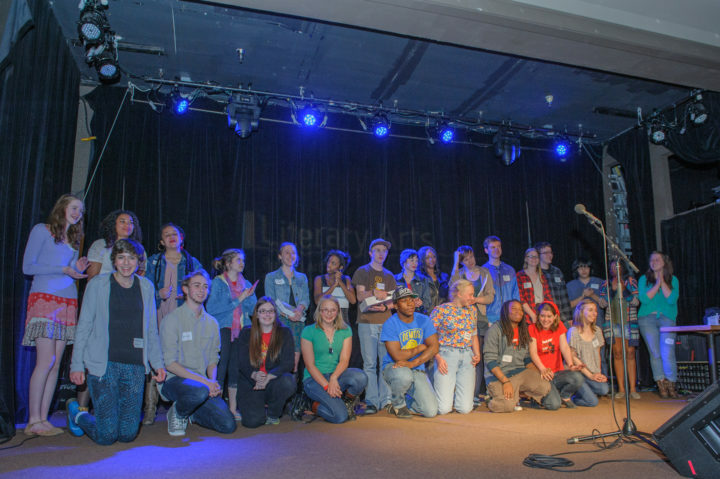 It was a fantastic evening that garnered coverage in Portland Monthly, The Oregonian and on OPB. Wieden + Kennedy generously sponsored Verselandia this year, and brought the five winners to their offices in Portland for a day. 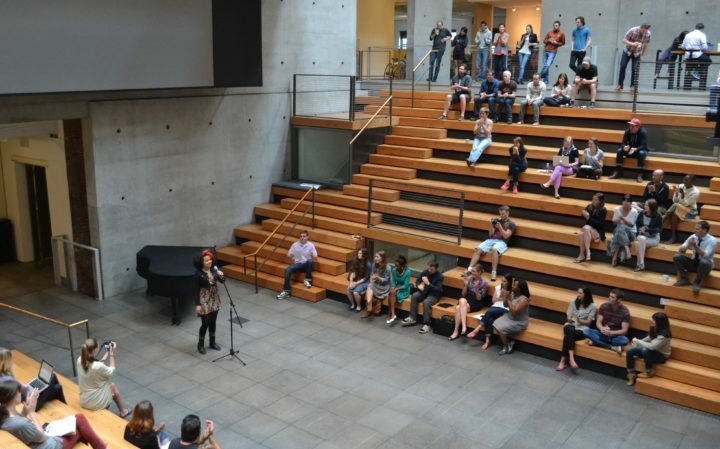 First, the students performed in the atrium for the staff, and they received a standing ovation and whistles of appreciation. 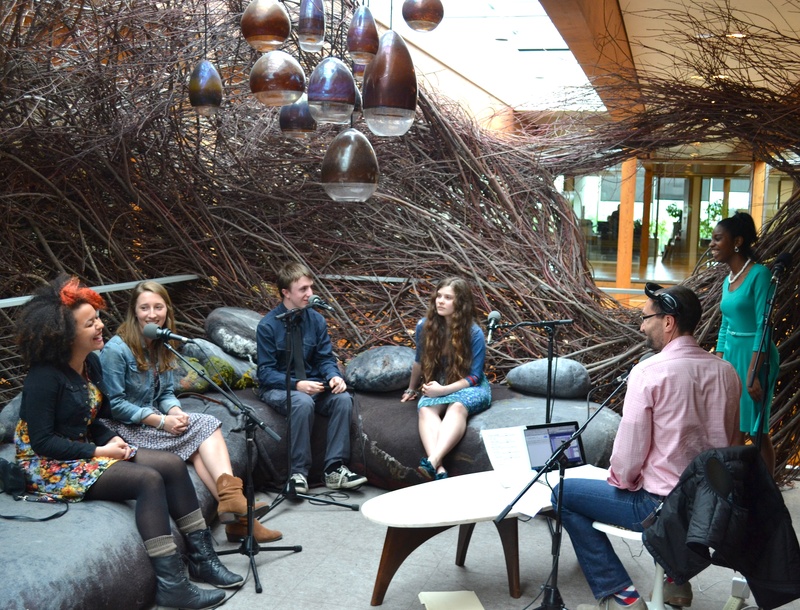 Then they took an elevator to the top floor and participated in a live broadcast on OPB’s Think Out Loud, recorded in “The Nest,” which is perched high above the atrium. Sunlight filtered into the room whose walls are made from whorls of branches, and the students sat on an enormous felted bench made to look like mossy rocks. When they performed their pieces, their voices echoed down through the building. It was an amazing moment. Afterward, students went on a tour of the building, including the Studio, a dark and silent cave where graphic designers work out their ideas, followed by the bright and noisy office where the Nike staff collaborates, as well as the work tables set up for WK 12 students. They then had lunch at Bluehour with W+K co-founder Dan Wieden and other leaders of the agency. Students mostly reflected on their writing processes and Verselandia experience. After lunch, students met with four members of the W+K staff in the lunchroom, who told the students their stories of how they started in advertising and how they ended up at W + K. According to Hunt Holman, a contractor for Literary Arts and Student Wrangler Extraordinaire, “the overall point seemed to be that the students already had the skills and creative knack that W+K is always seeking.” Here’s to seeing where these connections lead to in the bright futures of these winners!